Members of the Virginia General Assembly acknowledge concerns of corrections officers regarding high turnover, low staffing, and lower-than-average pay are legitimate. Lawmakers are hoping to take a closer look at issues found in the 13News Now investigation Crisis in Corrections. Corrections officers in Virginia believe a staffing shortage is creating a dangerous situation. One lawmaker said their concerns are legitimate and should be addressed. Some legislators discussed the problems with officers at a town hall meeting in Richmond Monday. “Everybody deserves a safe place to work,” freshman delegate Cheryl Turpin stated. “We recognize, I think, that those are some of the lowest paid folks,” Sen. Frank Wagner said. “I think you're bringing to light some of the more important criminal justice issues that we're dealing with right now,” noted Del. Mike Mullin, who is also a prosecutor. In the course of our investigation, corrections officers said the turnover is so high and the staffing so low that the situation is a ticking time bomb. Wagner said Department of Corrections funding and pay raises for corrections officers didn't appear to be a top priority in the original budget. “Clearly, I think your efforts here at Channel 13 have moved that up on the priority list because, certainly, if we're not aware of a problem, it's very difficult for us to fix,” he expanded. State leaders said the budget proposal includes a 2 percent raise for all state employees and funding for each correction officer to get an additional $1,145 increase. When added to what DOC reports as the average salary in Virginia, you get an annual pay of $37,245.86. Federal statistics show the national average salary for COs is $47,600. Even with the additional money, corrections officers in the Commonwealth still will be paid $10,354.14 less than the national average. We asked if that's enough. 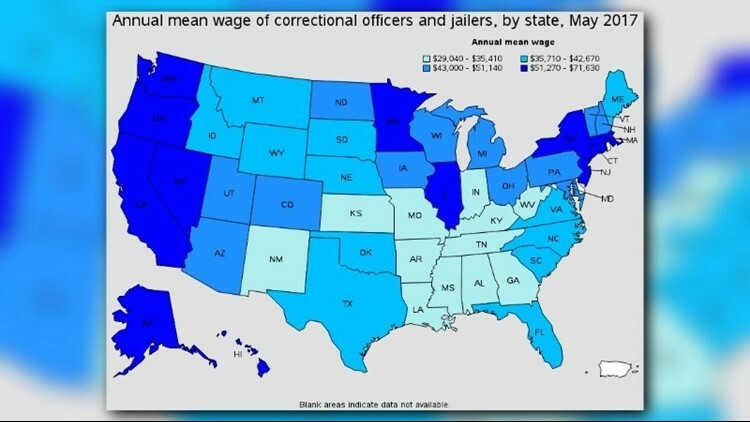 Corrections officers who reached out to us said it's just “a drop in the bucket.” Because healthcare premiums likely rise, they considered it "a slap in the face." Mullin agreed the Virginia General Assembly has to take responsibility because the consequences are real. “I've prosecuted countless numbers of crimes coming from our jails and our prisons where people were injured as a result of violence by a prisoner, and I don't want to have to see that happen to anyone ever again,” Mullin added. Virginia's Secretary of Public Safety and Homeland Security wasn't able to attend the officers' union town hall in Richmond Monday. "Under the leadership of Director Harold Clarke, Virginia has a world-renowned corrections system,” Secretary Brian Moran wrote in a statement, which went on to say: “We have now posted the lowest recidivism rate in the nation for two consecutive years, and that is in part due to the dedicated and passionate staff at the Virginia Department of Corrections. In 2016, Governor McAuliffe made historic investments in our corrections system through his introduced budget by including $2 million in FY17 and FY18, filling 36 vacant correctional officer positions each year. In addition, Governor Northam, in his introduced budget, provides funding and positions for additional probation and parole officers - both in FY19, $540,770 for 17 positions, and in FY20, $1,781,796 for 35 positions. The safety of correctional officers, probation/parole officers and inmates remains a top priority for Governor Northam, in conjunction with reducing our national best recidivism rate."